Around eight, after we finished and I was washing the dishes, my wife called her office to make arrangements for that day and, just in case, for the next as well. Then packing the [bottomless] bottle [of beer] and contract securely in a shoulder bag, as before, we set out about nine under partly cloudy skies, the weather feeling a bit unsettled, and reached Mr. Webster's office with five minutes to spare. 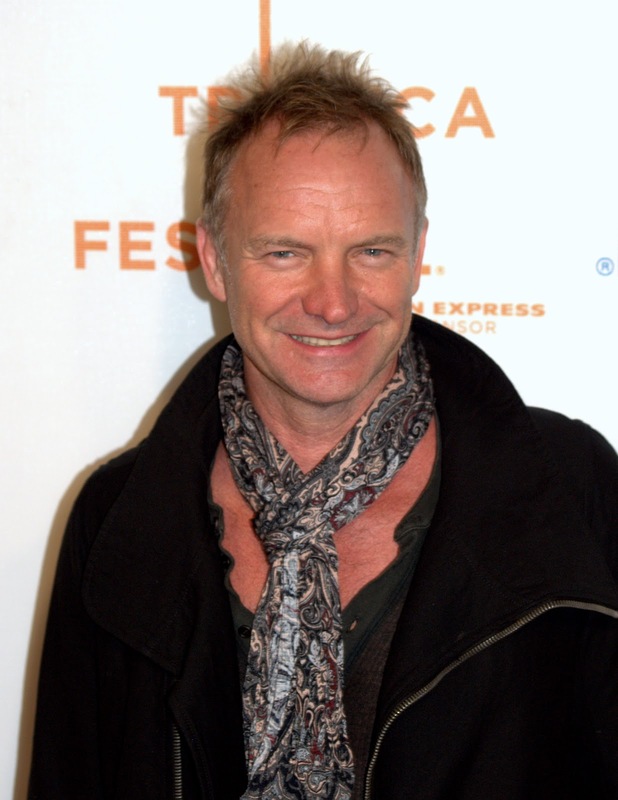 Oddly, we saw no sign to announce his legal practice, but we easily located it from the address on the card given me. 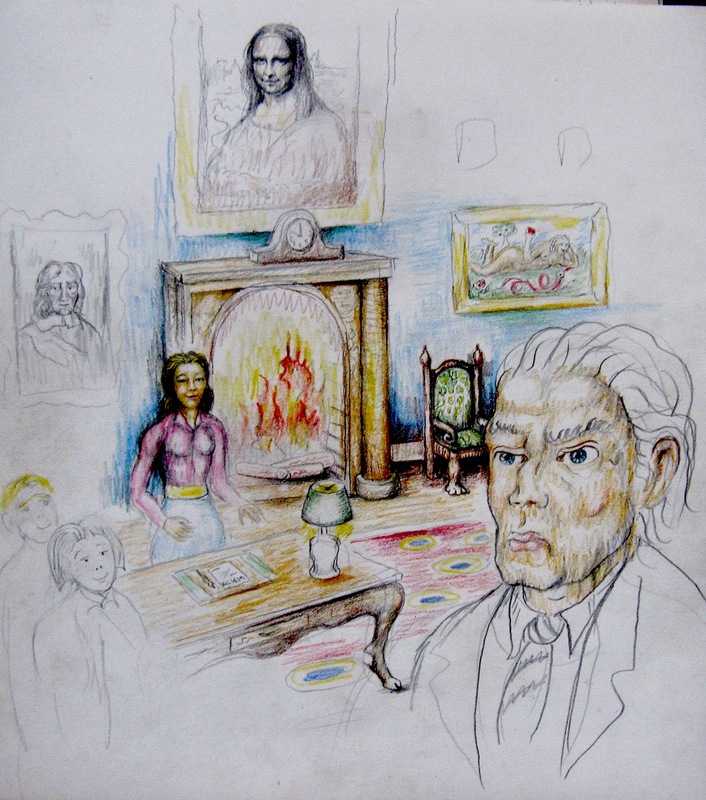 Upon entering his waiting room, we marveled at the opulence devoted even to the area where his secretary worked. 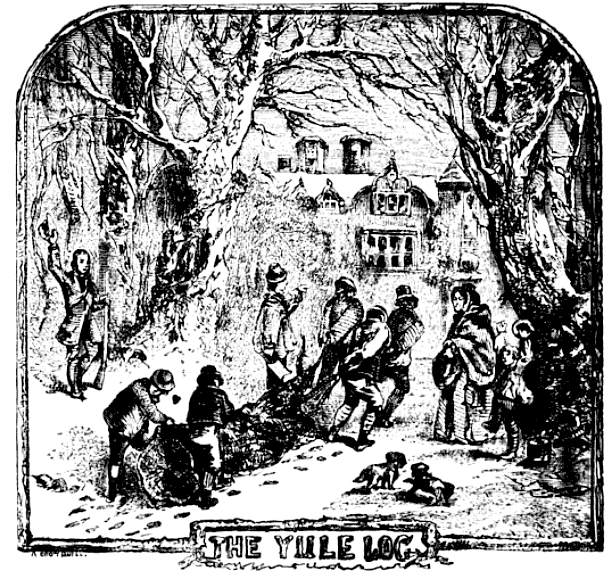 No other clients were present, though we inferred from the luxurious furnishings that he must have some very wealthy ones, but when we asked the secretary, a stylish woman seemingly in her fifties, whether Mr. Webster were with a client, she said "No," explaining that he generally accepted no cases and mostly devoted himself to legal research, though of a recondite sort that required broad reading. 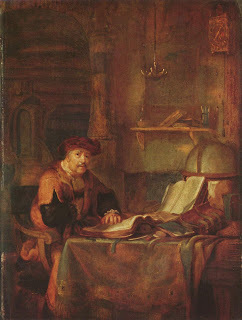 Her job was to obtain the books and documents he needed. Everything she explained accorded perfectly with what the gentleman had told me the day before. We see on the far wall three paintings: John Milton, Mona Lisa, and Eve. All three are originals . . . by Terrance Lindall! Webster obviously has good taste. Or perhaps his secretary does . . . I've been proofing the text with illustrations by Lindall, so publication is still some weeks off. Meanwhile, enjoy the tantalizing hints of what lies in store . . .
Last Time I Give Blood . . .
Don't let Terrance Lindall draw your blood, or this could happen to you. It's enough to cause nightmares! I just finished reading your story. I read about half of the story yesterday night, just before I went to sleep, and had a very, very weird dream. I was lost on an island somewhere, following a road down toward the sea. There was a bridge across to land, but snakes covered the bridge, so I didn't know if I should try to cross. I was afraid and woke up confused when I got up this morning and started reading from where I left off because I was curious of how the story would end. But I had to stop soon because my iPad was out of battery. I wanted to reply to you sooner about your writing, but I just finished reading it! How you write your story really made me wonder about the ending a lot and the mysterious setting of the whole story really put some strange images in my head. 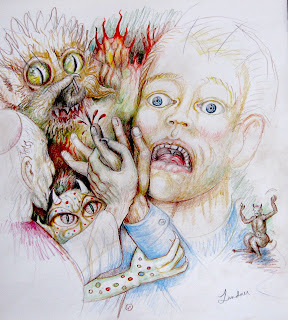 She now wants to draw some of those images, which I fear might be as scary as Terrance's colored drawing above. I'm beginning to suspect the story -- my 'uncanny' story -- might be cursed! Just kidding . . . sort of . . .
Judgment Day for our Naive Hero . . .
What, then, is law? It is the most basic foundation upon which is established the universal order of all things. Natural philosophers refer to laws of nature, moral philosophers to moral law, legal philosophers to human law, and each category of law stands worthy of reverence. Respect for the laws of nature serves as paradigm for respect towards other laws. Consider the heavens, which bow in reverence to the laws dictating the orderly motions that we discover above. Imagine the disorder were the heavenly bodies to flout their laws. No, rather, such chaos is unimaginable. 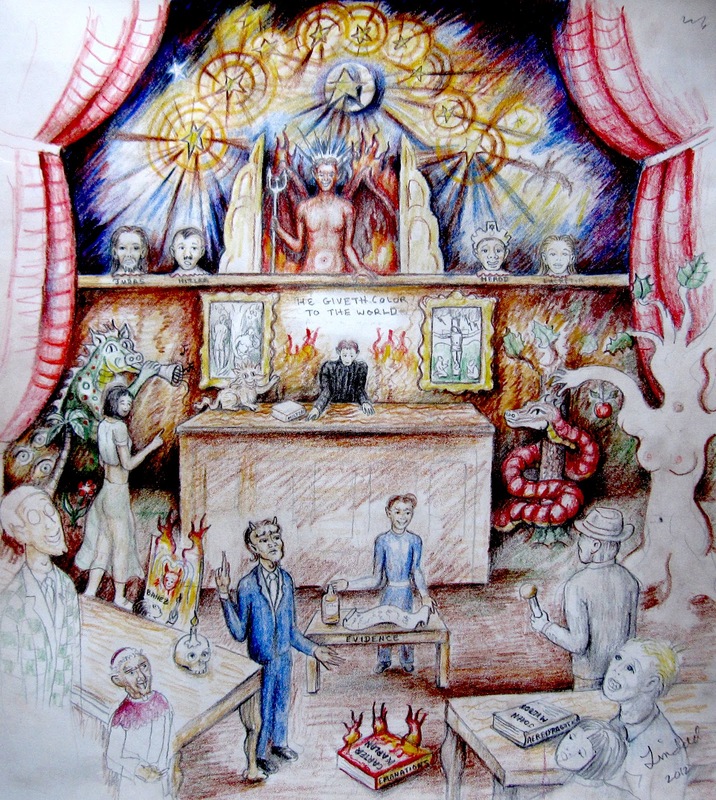 Beelzebub is partly lying, of course, for he and Satan's other minions rebelled against God's laws, as described in Milton's Paradise Lost, and the heavens no longer obey the original laws, for the planets themselves follow their erratic paths, from which they derive their name: "planets." The astute reader will catch these points without their being pointed out, but despite his lies, Beelzebub speaks enough of the truth to sound persuasive, thereby giving our naive hero the legal sweats . . .
Jughead Jones and Mike Doonesbury? For some obscure reason, I was thinking about Jughead from the Archie Comics the other morning as I lay awake in bed waiting for my clock alarm to sound, and I began to wonder why he was drawn with such a long, thin nose. I didn't figure out why, except that it makes him appear more comical, but I suddenly recalled Doonesbury's similar nose, which was exceptionally long in the early drawings. Doonesbury's nose is, if anything, even longer and thinner than Jughead's, and I wondered about Trudeau's reason for giving this character a nose like that, but I again could only imagine, at first, that the reason was to make him more comical. As I thought further, however, I wondered if Trudeau was thinking of Jughead when he first drew Doonesbury. Do any readers know the reasons for these long, thin noses, and also if Trudeau was influenced by the image of Jughead in first drawing Mike Doonesbury? "Angry Man In New York"
When En-Uk has learned this variant by heart, I might introduce him to the real lyrics . . .
A Terminal Deferment . . .
Jorge Luis Borges imagines the universe as a gigantic library, consisting of an indefinite number of hexagonal rooms, each filled with rows of books. "Each book," writes Borges, "is of four hundred and ten pages; each page, of forty lines, each line, of some eighty letters which are in black color." Most of the text inside the books, however, consists of sequences of letters utterly incomprehensible and unreadable to the people inhabiting this mysterious library. Occasionally, some have made valuable discoveries of fragments of meaningful text; but "for every sensible line of straightforward statement, there are leagues of senseless cacophonies, verbal jumbles and incoherence." Who created this library -- let alone authored the books -- no one knows. For a long time, the inhabitants believed that these enigmatic books were written in old, forgotten languages. But since some of the books consist of only one or two letters, the language theory is eventually rejected. Finally, a librarian makes the deduction that the library is total - that everything which can possibly be expressed in any language at any time throughout history, every possible linguistic combination, is contained in these books. 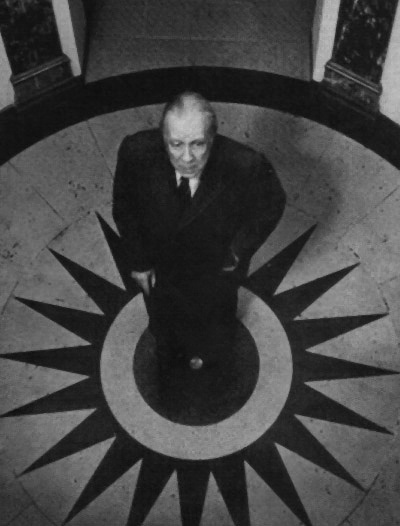 "Everything," writes Borges; "the minutely detailed history of the future, the archangels' autobiographies, the faithful catalogue of the Library, thousands and thousands of false catalogues, the demonstration of the fallacy of those catalogues, the demonstration of the fallacy of the true catalogue" -- and so on. This library is a confusing farrago of the senseless and the meaningful, the stochastic and the orderly, the chance and the regular -- a bibliographication of the atoms and their swerve! Everything seems to repeat almost as though Nietzsche's eternal recurrence had congealed from temporal to spatial -- a point that one can ambiguously take, pausing either before or after "almost." Borges' hilarious story illustrates an uncanny dimension of language; that our language has a limit, which in effect limits what we may say and think about the world. 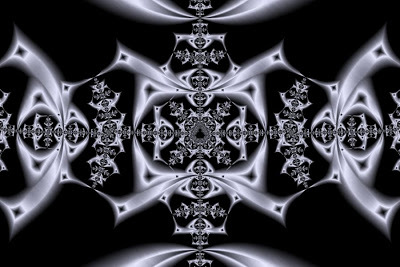 That is, language is essentially a vast, but finite, system of different signs and codes which in various combinations generate meanings, albeit not by referring to something outside the system, but rather from within the system itself -- between the different signs. Using a dictionary to understand the meaning of a particular word, for example, will lead to other words; these words, in turn, lead to new words, and so on. Somewhere between these words, meaning temporarily resides. However, the meaning -- of things, objects, phenomena -- is never permanently fixed, but constantly slides, or is deferred, along an interminable chain of signifiers. First, Sorensen catches me by surprise by affirming that the story implies a finite universe of discourse. I had thought that by "indefinite number of hexagonal rooms," he meant an unbounded number, indicating that there is always 'room' for one more section of books, a bit like Hilbert's paradox of the Grand Hotel, a hypothetical building with an infinite number of rooms, each of them occupied, yet the hotel always accommodates more guests by moving the guests residing in the first room into the second room, those in the second room into the third room, those in the third room into the fourth room, and so on endlessly (suggesting that Mary and Joseph ought to have tried Hilbert's Hotel in Bethlehem). But perhaps I've not quite understood. Maybe Sorensen means that language is finite, but the universe is infinite because every book occurs infinitely many times. Yet, if I recall, Borges doesn't state quite that, for he speaks of books that differ only by a letter or a comma, not books that are identical, nor does Sorensen say this either. Perhaps I'd better re-read Borges . . . or talk to Sorensen. What distinguished Japanese robotics early on -- and now almost all roboticists have followed suit -- is the concept of embodied intelligence or embodied cognition. Roboticists point out that intelligence cannot exist in the form of an abstract algorithm, but requires a material body. The emphasis on embodiment recognizes that the body (whether human or robotic) is actively and continually in touch with its surroundings. Moreover, cognitive processes originate in an organism's sensory-motor experience. Only dynamic interaction between a robot and its environment can generate emergent autonomous behavior; behavior initiated by some external control system cannot. Advances in artificial life, including nanotechnology and self-evolving genetic algorithms, have led to the development of new sensory, actuation and locomotion components for robots that, in turn, have enabled the actualization of artificial embodied cognition. Central to the emphasis in robotics on embodied intelligence are qualitative studies in the field of child development. My point is that the meaning of words does not ultimately derive solely from the meaning of other words. Continental philosophy is too fixated on the abstract level of Ferdinand de Saussure's linguistic theory, thus ignoring the concrete manner in which language learning is embodied. Language learning initially begins with the child learning rather concrete things through interacting with its environment and learning language by hearing what things are called -- though I don't mean that language is fundamentally a matter of learning nouns, even if, as Gertrude Stein noted, "A noun has been the name of something for such a very long time" -- but if meaning were really constantly deferred, the child would never learn to communicate. I could of course -- as an adult -- prepare a lecture in which I offer a sequence, arbitrarily long, of words that I don't know defined in terms of other words that I don't know. But eventually, the words would lead to a word that I do understand, and deference to deferment would terminate. I could defer termination for an indefinite term only artificially, but not interminably, for "language is essentially a vast, but finite, system of different signs and codes," as Sorensen notes, and I thus must eventually encounter a word that I do know. I therefore differ on deferment . . . unless I simply don't yet know what this word means. Now where did my dictionary get to . . .
Have Yourself a Scary Little X-mas! When You Thought Nobody Was Watching? Sounds like my kind of morning! But based on Gray's title, his description, and the above photo by Carlos Luján, I ask myself, how did this city get to be this way? Some cities have old quarters. 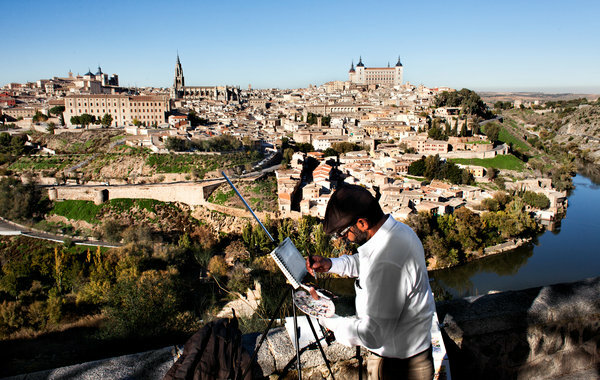 But the whole of Toledo is a historic district, indeed a Unesco World Heritage site, remaining largely intact throughout the many violent takeovers of Spain . . . . Because Toledo was considered the holiest city in Spain in the Catholic faith, its invaders were careful not to destroy hallowed ground. So it survived the Moors, Visigoths, the Spanish Civil War. Enemies spared the city because it was so sacred for Catholics? I'm doubtful about this reasoning. Holier sites have seen utter destruction. Genghis Khan and his descendants had no qualms about razing entire civilizations, and the Mongols would have obliterated Mecca, had not a great Khan died, bringing about a military withdrawal from the Middle East. The Romans destroyed the city Carthage and later the sacred Temple in Jerusalem. 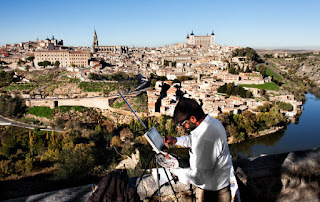 Muslim armies destroyed other cities, so why not Toledo? I don't know, but I suspect that it's not due to the city's Catholic sanctity . . .
A Thousand Falls . . . Throughout the novel, the lunar calendar is used to denote Japanese dates. The lunar calendar could be anything from three to seven weeks "behind" the Gregorian calendar, depending on the year. Thus "the First Day of the First Month" corresponds not to January 1 but to a varying date between the back end of January and the rear middle of February. Years are referred to by their Japanese era names. This means that I'm never really going to know what time it is -- not that anyone else really cares, least of all at twenty-five or -six to four as I type these words -- but which can be an annoyance for a precise sort of fellow such as myself. I know, however, from my above-noted experience, that the extra trouble will be repaid in literary pleasure, so I'll forge ahead. Besides, since Mitchell does provide the Western year in which the story begins, there's likely a record online giving equivalent dates in the West's Gregorian and the Japanese lunar calendars. 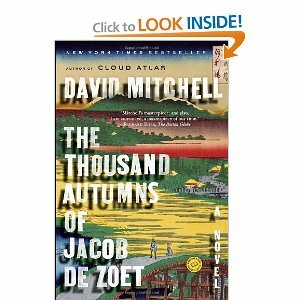 Speaking of Mitchell, I am awaiting a nearby showing of Cloud Atlas in Seoul, whenever that might be . . . The Nightmare Life-In-Death in My Story . . . Since I was alluding to these two lines, I took "thick" as my verb and thus formed the past tense as "thicked." 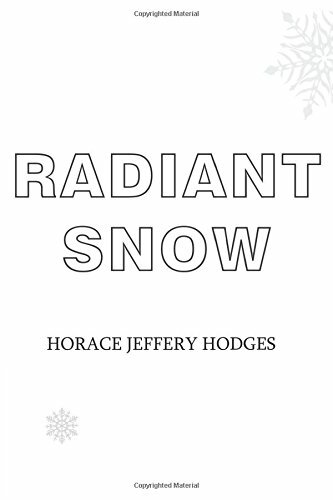 This over-correction -- possibly due to overzealous software (Microsoft Word, for instance, is forever 'correcting' my English) -- is not so dreadful, but I prefer the original for its clearer connection to Coleridge's poem. I'll check the final proofs in the book version . . .
Over the last three years, I have examined interviews, case studies, suicide notes, martyrdom videos and witness statements and found that suicide terrorists are indeed suicidal in the clinical sense . . . . Although suicide terrorists may share the same beliefs as the organizations whose propaganda they spout, they are primarily motivated by the desire to kill and be killed -- just like most rampage shooters . . . . [W]e should think of many rampage shooters as nonideological suicide terrorists. In some cases, they claim to be fighting for a cause . . . but, as with suicide terrorists, their actions usually stem from . . . [a] deeper and more personal . . . . triad of factors that sets these killers apart. The first is that they are generally struggling with mental health problems that have produced their desire to die . . . . The second factor is a deep sense of victimization and belief that the killer's life has been ruined by someone else, who has bullied, oppressed or persecuted him . . . . The key is that the aggrieved individual feels that he has been terribly mistreated and that violent vengeance is justified. In many cases, the target for revenge becomes broader and more symbolic than a single person, so . . . . the urge to commit suicide becomes a desire for murder-suicide . . . . The third factor is the desire to acquire fame and glory through killing . . . . Attackers who commit murder-suicide in public are . . . brazen and unusual. Most suicide terrorists believe they will be honored and celebrated as "martyrs" after their deaths and, sure enough, terrorist organizations produce martyrdom videos and memorabilia so that other desperate souls will volunteer to blow themselves up . . . . [R]ampage shooters have often been captivated by the idea that they will become posthumously famous. This is interesting, and not insignificant, for it undercuts the Islamist position that 'martyrdom operations' are not suicide missions and thereby entails that these are forbidden by sharia . . . not that I expect Islamists to accept the findings of an 'infidel' scientist. One question, however, remains for me: Are the causes of the 'mental illness' also parallel, or does Islamist ideology perhaps drive some individuals insane? Islamism is a grievance ideology, forever blaming external foes for Islam's problems. Anyone who's taken the trouble to look into the matter will attest that Islamists typically blame the Jews, primarily, for all the evils in the world, and they invariably cite the forged documents known as The Protocols of the Elders of Zion as if these fakes were proof of Jewish aims to dominate the world. Islamists certainly encourage "a deep sense of victimization" among their followers, and I happen to think that Islamism gives rise to extremely frustrated, unhappy individuals "struggling with mental health problems." Moreover, Islamist ideology not only promises that suicide bombers will be "honored and celebrated as 'martyrs' after their deaths," it also promises an eternal afterlife of endless sensual pleasure of drinking and whoring. In effect, these 'suicide' killers get to keep on living, even living it up! I therefore think that Professor Lankford needs to take his investigation at least one step further and determine if Islamism produces the clinical state of mind that he describes . . . or perhaps he has already, in his book. I came to your page trying to find scholarly articles on 'Gypsies', turns out you are just a fraud. For all your education you're surprisingly ignorant. Thanks for the cultural genocide. Nice comment to leave on a blog entry commemorating a good man's death. As for your intemperate remarks, I suggest that you familiarize yourself with the expression "gypsy scholar," which is a well-known label for a scholar without tenure who moves from university to university in search of jobs. There are a lot of us. When you're no longer ignorant of the expression and its meaning, you'll not further embarrass yourself in future encounters with gypsy scholars, nor will you continue to make ridiculous accusations of "fraud" and of "cultural genocide." Gypsy scholar: is an informal term given to some academics who either move several times between institutions and/or work at two or more institutions at a time. There are several possible reasons explaining the existence of gypsy scholars, among these are the fact that many teaching jobs are now either part-time or terminal (1-3 years), with tenure-track positions harder to secure, and also a high cost of housing and living. The latter appears to have become a fairly common situation in California, where the price of housing has skyrocketed (as of 2005). We see, then, that I am the one facing an existential threat! The outraged fellow, for his part, did not respond to my reply to his comment, nor do I expect a reply to this post. No anonymous commentator need ever apologize for rudeness or false accusations -- that's the beauty of anonymity. This particular anonymous, frustrated commentator, angered -- in his ignorance of a well-known English expression -- at failing to find what he had wrongly expected, finds himself instead aggrieved at my putative, inadvertent 'slight' against his profound misunderstanding of English and rouses himself in righteous anger to a peak fit for a fit of pique, all the wilder for its unmeasured animosity, so exaggerated as to accuse me -- despite my obvious scholarly isolation, my lonely academic wanderings -- of "cultural genocide"! Thus have I single-handedly disposed of Romani culture, something not even the National Socialists managed to do. In the mind of my anonymous critic with a grievance, I'm obviously not a gypsy scholar, but rather a fascistic activist . . . I think it's a cool story and I really wish this story is not about you because that would have been a very scary experience to have in your life. I assume she means that she holds fast to a "hope" that the story's not about me, but if you look closely, you'll see that it IS about me -- or so Terrance implies -- for look at the signatories to that contract! Uh-oh . . . I seem to have been a signatory to that contract. I'm glad I have Dan Webster on my side . 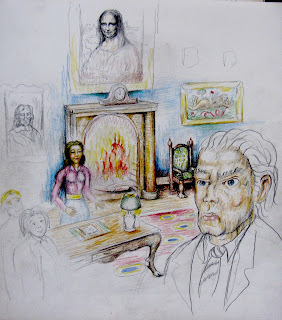 . .
Webster's standing in the lower right-hand corner of the courtroom scene. In fact, if you'll look carefully at Terrance's illustration, you'll see more and more details, many of them humorous. Terrance is an intellectual artist with a pictorial sense of humor, so the attentive viewer will find more and more literary and aesthetic allusions. For those interested, the judge is Belial, the other devil is Beelzebub, and the large cat is Behemoth, a demon in disguise . . . In testing various publishing possibilities regarding The Bottomless Bottle of Beer, Terrance Lindall succeeded in uploading a number of his Paradise Lost illustrations at the site issuu. Just to be absolutely clear, these constitute an illustrated book of Terrance's synopsis of Milton's epic poem, along with an introduction by the artist and curator Yuko Nii, of the Williamsburg Art and Historical Center, and a commentary by the Milton scholar Robert J. Wickenheiser, who also collects books relevant to Milton, and especially favors illustrated works. Wow! Really great -- and the color is astonishing. I don't happen to know the price, but interested readers can email the WAH Center and inquire. I regularly receive emails from the Foreign Policy Research Institute (FPRI), with which my old 'paleoconservative' history professor at Berkeley, Walter A. McDougall, is associated, and a recent missive was penned by the man pictured above, James Kurth, one of the editors of the FPRI journal, Orbis, and a senior fellow at the FPRI's Center for the Study of America and the West. The missive referred to is titled "The Crisis of American Conservatism: Inherent Contradictions and the End of the Road," which sounds like it would be self-consciously a swan song, and indeed it is, for it looks directly at the stark facts confronting American conservatism . . . though Kurth holds out hope that some reinvention of conservatism can be achieved and prove successful. In recent decades, political analysts have found it useful to interpret American political movements by distinguishing between different policy dimensions or arenas. Thus, conservatives have been divided into (1) those who are most concerned about economic or fiscal issues, i.e., pro-business or "free-enterprise" conservatives; (2) those most concerned with religious or social issues, i.e., pro-church or "traditional-values" conservatives; and (3) those most concerned with national-security or defense issues, i.e., pro-military or "patriotic" conservatives. Although Friedman and his followers were always talking about the virtues of the free market and of conservatism in economic affairs, their approach was not truly a free-market or traditional-conservative one at all. Instead, they advocated a controlled market in matters of money, credit and finance, while advocating a free market with respect to almost everything else. And the market in money, credit, and finance was to be controlled by an oligopoly of the major banks, implemented through the Federal Reserve System (whose name made it sound like some kind of government agency, but whose reality made it more a cartel of profit-making banks). I thus won't summarize everything, but I encourage readers -- regardless of political position -- to peruse the article for a rational, intelligent, authoritative analysis of the current state of American conservatism and how it reached this state. Good things can also start up again . . . Curious, I attempted to peer through the window, but the shop was dark, and I could make out nothing of the vague room's shape, nor of anyone within, nothing distinguishable in member, joint, or limb, just seemingly insubstantial shadow. [On Friday] I was proctoring a test with a fellow instructor. She's a Korean, but her English is good. I showed her the story with the four images, and she sat down and began reading it, growing so engrossed that she forgot about the exam. I let her read as I proctored on my own. She really liked what she was able to read, also the illustrations, and she found the story scary -- but she reached only the blood-taking scene. Terrance, in turn, sent me a link to his composite video advertising our novella, to come out sometime next year. 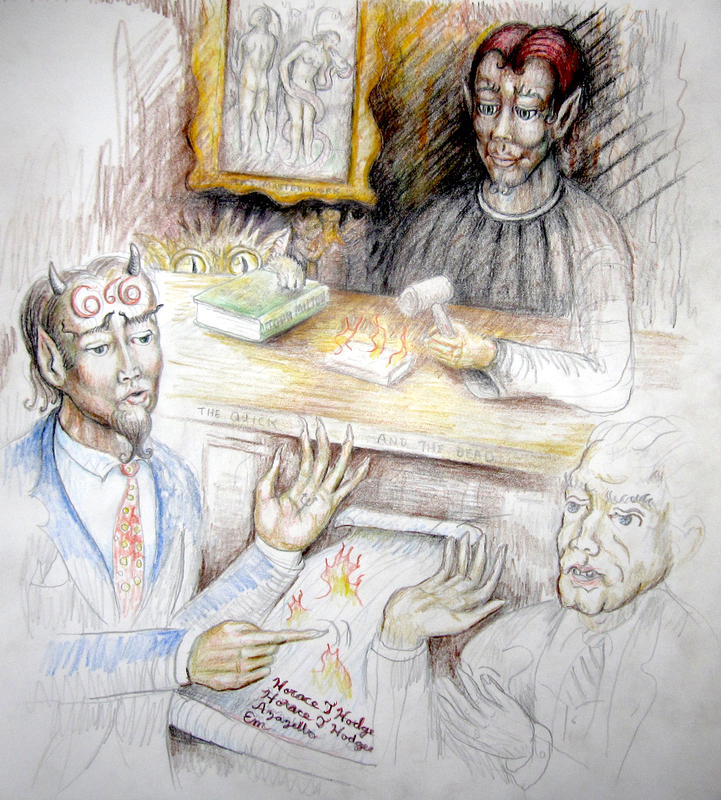 By the way, some readers interested in Terrance's Paradise Lost illustrations might want to compare the darkly flaming Mr. Em in the image above with Terrance's flaming Hell-bound Satan, if only to see the continuities and differences . 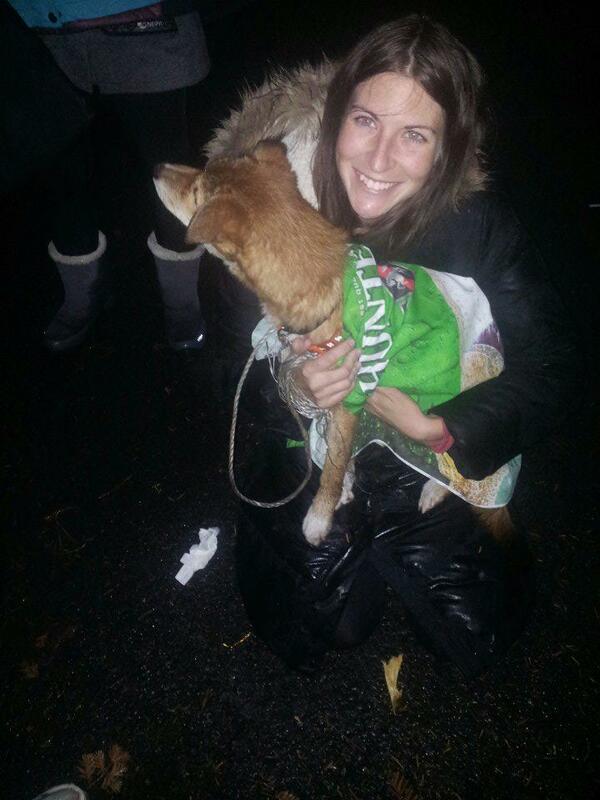 . .
Claudia Mamet's Dog "Boots" Has Been Found! Received the great news this morning that Boots has been found!! Claudia, is that your comment? I ask because this morning when we spoke, you'd heard nothing yet. It's confirmed! See the update. Claudia somehow managed to get thousands of individuals -- both Koreans and expats -- involved in the search for Boots, and she found him! A former student treated me to coffee last Thursday morning and gave me a card that she'd made for me as a Christmas present. I don't know how she made it, for it's actually two images, one on paper (above) and the other on a translucent cover (below). I speculate that she colored the paper first, then pressed the cover onto it. She's quite good, especially since she's been drawing and coloring for only about three years, usually illustrations for stories. I still have a lot of grading to do, so this is all for today . . .
Robert Bellah's Critique of Sociobiology? 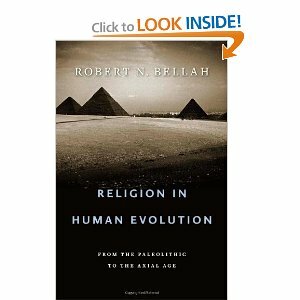 Although he mentions the word "sociobiology" only one time in 746 pages (page 261, to be specific), much of Bellah's book draws on paleontology and biology, both comparative and evolutionary, to refute sociobiological views by showing that culture extends far down the evolutionary tree and deep into evolutionary history, by which he implies the co-evolution of culture and biology, an antireductionist view in which each influences the other -- or so I thought the other night in an insomniac hour I lay upon my bed thinking about Bellah, his views, and his role as my adviser back when I was studying at Berkeley, with one thought leading to another, ending with this contra-sociobiological moment, which I might go into more deeply some day when I've finished reading the book. Sorry to be so brief this morning, but I have final exams to administer and final papers to grade . . .
Not the sort to lose face . 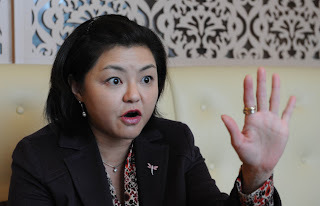 . .
KH: How do you analyze the true intentions behind President Obama's recent reference to China as an "adversary" as well as a potential partner? Hwang: Foreigners are often overly suspicious about "true intentions" or motives behind U.S. leaders. There is no hidden intention or meaning, other than exactly what President Obama stated: that on some issues, China is and should be a partner, but on many others, China is an adversary. I like the implied retort: The hidden intention is the one hidden by suspicion of a hidden intention. Just take Obama's words at their face value, folks. In short, accept the obvious. I appreciate that Professor Hwang is the one explaining this to the Korea Herald, for having a Korean point it out raises the credibility among Koreans. Or maybe not. Koreans might suspect Professor Hwang of trying to hide something, and therefore ask themselves, "What are her true intentions?" Think of the Tablo case . . .
Kinfolk with Careers: Continuing Saga . . . I've previously mentioned that my brothers are all more successful than I am, and are still rising. I, by contrast, exemplify the Peter Principle: I long ago reached my level of incompetence and have remained there. 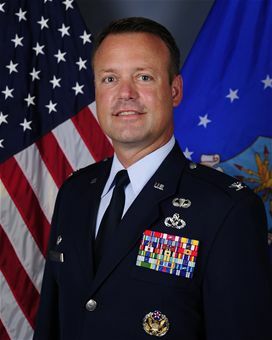 Colonel Hodges entered the United States Air Force after graduating from the USAF Academy. He has held several installation, major command, joint, multinational, and Pentagon level positions in the continental United States, overseas, and in deployed environments. Let's keep an eye on his career and see if he rises higher just as rapidly -- even if his steep rise makes my career look not merely static, but in relative decline . . .
As Murphy put it, "If anything can go wrong, it will." "That's entropy," Pynchon would observe. And as everybody else seems to say, "All good things must end . 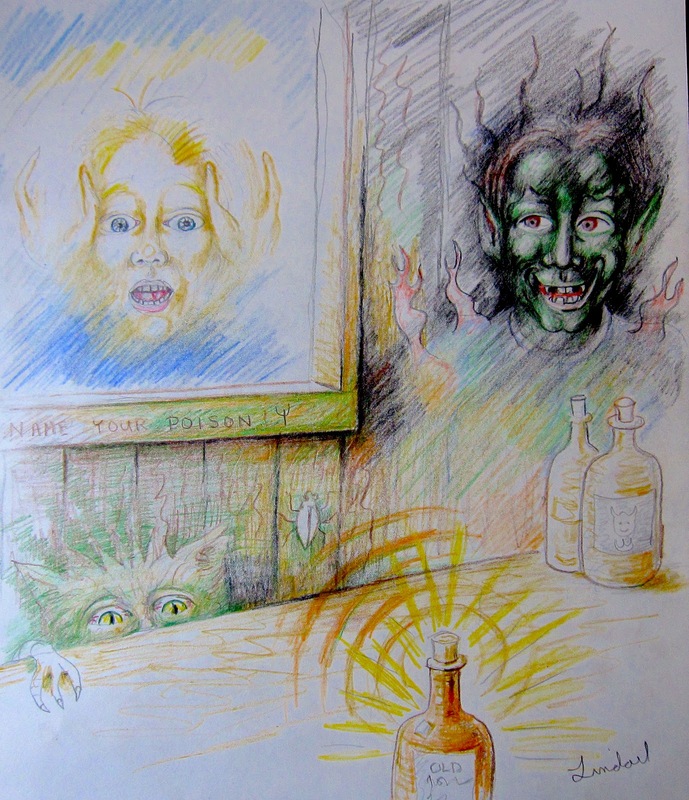 . ."
Readers can draw their own conclusions as to the illustration's verisimilitude, but I noticed something gone wrong: The word "Eve" was capitalized. That was not what I expected . . . nor what I wrote. I had written "eve" -- meaning some "evening," but with an allusion to "Eve." The allusion is not one intended by the naive hero, for he is too ignorant to have even an inkling of what is going on. It's a moment of dramatic irony, not conscious allusion. If he were to refer to "Eve," then he would be thinking of Mr. Em as Satan, and that would have far-reaching ripple effects setting up interference patterns in my story. Something thus went wrong between my sending the manuscript and its publication -- possibly a software problem, possibly a typo -- but these things happen. I therefore set the record straight here: "eve," not "Eve." Anyway, let Sa-Rah know what you think of her drawing . . .
Emanations is an anthology series featuring fiction, poetry, essays, manifestos and reviews. The emphasis is on alternative narrative structures, new epistemologies, peculiar settings, esoteric themes, sharp breaks from reality, ecstatic revelations, and vivid and abundant hallucinations. The editors are interested in recognizable genres -- science fiction, fantasy, horror, mystery, local color, romance, realism, surrealism, postmodernism -- but the idea is to make something new, and along these lines the illusion of something new can be just as important. If a story or poem makes someone say, "Yes, but what is it?" then it's right for Emanations. Essays should be exuberant, daring, and free of pedantry. Length is a consideration in making publication decisions, but in keeping with the spirit of the project contributors should consider length to be "open." Our editorial vision is evolving. 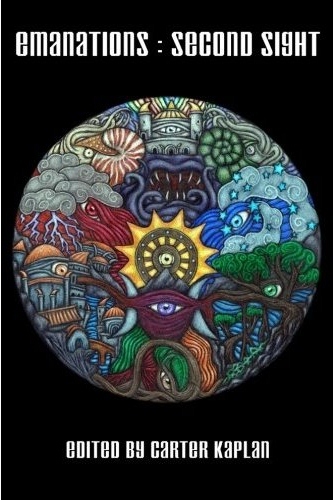 Contributors should see themselves as actively shaping the "vision" of Emanations. 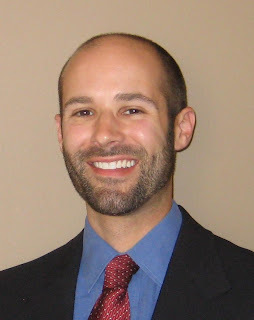 Send files with brief cover note to Carter Kaplan. For more information see Kaplan's announcement. Hmmm . . . well, to paraphrase High Priest Tzekel-Kan, this is not what I expected from Cthulhu. Perhaps Tulio was right, the stars are not in position for sacrifice. There is, however, a Deadline: April 15, 2013. Perhaps the stars shall then be positioned for your sacrifice . . . In fact, when this happened, I was very calm. I'm a spine surgeon. I'm used to high stress situations. And I've certainly been under water plenty of times in my boat. 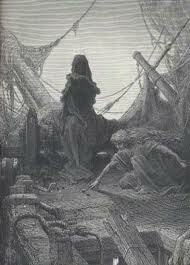 I immediately started to do the things that would either free the boat or extricate me from the boat . . . . But the volume and force of the water was such that my torso was absolutely pressed to the front deck of the boat. I couldn't move at all. I am very much a pragmatist. I recognized my predicament. I knew that I was too far from shore for anyone to get there. And I also have seen a couple of people drown in waterfalls in the years I've been kayaking. So I knew that even if they could get to me, the likelihood of their being able to get my body out of the boat in time was pretty slim. Then I went through a little bit of a life review -- not so much looking at events in isolation but looking at the unseen ripple effects of those events, how an event had an impact not just one or two degrees removed but 16, 20, 25 degrees removed. This was another profound aspect of the experience. It made me truly understand that every action, every decision, every choice, every human interaction really does matter. You may not know it, and almost always you don't recognize the impact. But everything really, really does matter. Then I felt my body break away from the boat, and as my body was coming out of the boat, I could feel my spirit peeling away from my body. I rose up and out of the river. I was immediately greeted by a group of beings, spirits, people. I'm never really sure what to call them, because those words mean different things to different people. They were so overjoyed to see me and welcome me and love me, and I knew that they had known me and loved me as long as I existed. I knew -- and when I use that word know, it's a very different sense of knowing -- I knew at an absolute, core level that they had been sent by God and were from God and were there to welcome me and guide me and protect me. People have asked, "Protect you from what?" I don't know. I only know what I know. I don't know what they were protecting me from . . . . They had physical form -- head, arms, legs -- and they were wearing something like robes. They were absolutely brilliant, radiating. And they were exuding this incredible love . . . . [and] they were taking me down this incredibly beautiful path to this dome-like structure, which was exploding with color and this absolute pure love of God. I knew that was basically the point of no return. It was the entrance to heaven -- whatever, however you want to describe it, that was where I was going . . . . Eventually we did get to the big arched entryway, and inside I could see many, many other spirits, angels, people -- I don't know what they were . . . . When I arrived they looked up and had this same sense of absolute joy at my arrival . . . . [and] it became absolutely clear to me that these people were joyful not only at my arrival but at the arrival of every person who shows up. More importantly, I understood how God can actually know each one of us, love each one of us as though we were the only one, and can have an incredible plan for each one of us. That's something that before this experience was difficult for me to grasp. But during this time, it became absolutely clear to me how that can be . . . . I was ready to dive across that threshold. But as I was pushing to do so, the spirits who had taken me there said that it wasn't my time, that I had to go back to my body and back to earth, that I had more work to do. [W]e were riding along together on an intricately patterned surface, which after a moment I recognized as the wing of a butterfly. In fact, millions of butterflies were all around us -- vast fluttering waves of them, dipping down into the woods and coming back up around us again. There's Zhuangzi's butterfly again, even millions of them! I don't mean to sound flippant about these sorts of experiences -- though as a fellow-butterfly, I must also flap my wings -- but I do wonder why one person approaches heaven astride a butterfly, whereas another seems to walk along a path. I'm therefore left with questions. Maybe the answers await my own death, unless I really am already Zhuangzi's butterfly, dreaming that I am a man sitting at my desk on an early Sunday morning writing these words, in which case I can report that the afterlife's not much different, after all . . .
Claudia Mamet's Missing Dog: "Boots"
I need your help desperately. On Saturday 1 December 2012, my dog Boots went missing at Wangsimni Station. I have been searching for him everywhere but I have had no luck. I made this YouTube video about him to try get media attention. Please SPREAD this video to colleagues, students (on CyberCampus), family, friends . . . EVERYONE you know. I will do anything to get my dog back but I cannot do it alone. I need your support. Click on the link so that the media realizes that I am getting support from the people of Korea. If you have Facebook, please also join my Facebook Search Page. I was at Wangsimni Station yesterday on my way home from Ewha, but didn't see Boots, who is probably outside rather than inside, given what Claudia says. Boots should be easy to spot since he's wearing a rather distinctive cloth, as you'll see in the video, so keep an eye out for him. Wonderful, to see Claudia again so happy! Hello, I am Professor Hodges, and I have been asked to offer a few words by way of introduction. Finland is well known to Koreans as a country whose native language is one of Europe's few non-Indo-European tongues and whose high school students rank even higher on the PISA test than Korean high school students themselves do! Today, we are graced by the presence of Professor Tuomo Lahdelma, a professor at the University of Jyväskylä, in Finland. 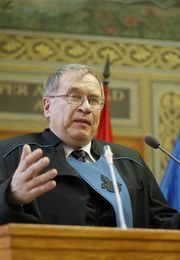 He is also the president of the International Association for Hungarian Studies. Professor Lahdelma has an MA in Finnish Language and World Literature and three degrees in Hungarian Language and Literature: a Licentiate of Arts, a Doctor of Philosophy, and a Docent of Hungarian Literature. Professor Lahdelma has been a visiting professor on a DAAD Fellowship in Germany at the University of Hamburg and a visiting Socrates Lecturer at several European universities. Moreover, Professor Lahdelma has been the recipient of several honors and awards, including a János Lotz Medal, a Pro Cultura Hungarica award, and a Balassi Sword Literary Prize, and he is a Knight, First Class, of the Order of the Lion of Finland and a Commander, First Class, of the Hungarian Order of Merit. I am honored to invite Professor Lahdelma to the podium, and I know that you will give him your full attention, for he will surely have words of knowledge and wisdom to impart. Professor Tuomo Lahdelma . . .
Those were my words of introduction, the first time that I've done this since I was an undergraduate student in Baylor University's Honors Program, when I had to introduce a speaker at one of the Honors Program's special seminars. I think that I handled this more recent one a bit more professionally . . .
Tower agents Bronson Bodine, Vitaly Yurchenko and Nabnak Tornasuk walked upside-down across the roof. Terrorists, perhaps? Quaint notion. To those drawing their life breath from the miasma of global espionage, they were something far more sinister. They crept along the wall, away from the roofs of the press boxes where they had been hiding since the afternoon. Bronson Bodine led the way, and as he moved forward, kicking his elaborate boots into the ceiling, he represented a kind of alternative Great Announcer commenting on their surroundings, now describing the chemistry of fuel mixtures, then speculating upon the identity of the Great Announcer, then explaining -- rather dryly and with that characteristic touch of winsome Bodine irony -- that the Silverdome was roofed-over with a flexible polymer derived from a quality GMO corn product formulated by the technology-of-tomorrow. Like their spirits, the roof floated on the air pressure inside the great arena. His friends grunted unevenly at his witticisms, their attention focused on their inverted situation and their walking gear. Barbed spikes mounted on the agents’ boots poked in and out of the fabric as they marched across the floor of the inverted world. 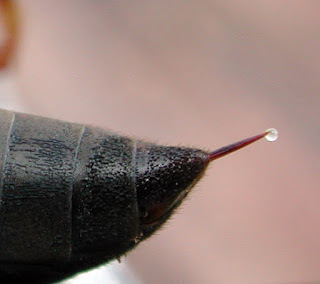 They controlled the spikes with rubber squeeze bulbs hanging from the sleeves of their camouflage jumpsuits. Earlier they had taken ZR-7-12, a compound that lowered their blood pressure to prevent inversion narcosis and unconsciousness. Unfortunately, it also elevated the propensity of the human brain to construe allegorical associations -- not so much hallucinations as ideas, which are even worse because their reality is based on thought itself. Something like science fiction, this passage from near the beginning would be clearer in its context, but just to help clarify, the three agents are on a mission to rescue their friend Eddie Allan, who has been tortured and is on display below so that the crowd can watch him die as the official Great Announcer relates those tortuous events taking place in the Silverdome. Will our incipient heroes succeed in their rescue mission? Purchase the anthology and find out . . . 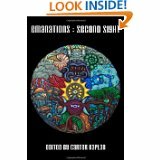 The "Look Inside" function has been activated for Emanations: Second Sight at Amazon, so you can preview some of the material. 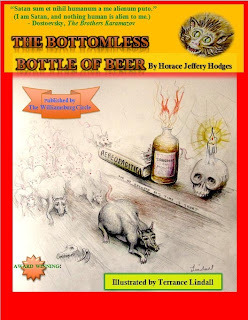 If my story, "The Bottomless Bottle of Beer," interests you, then click on this link, which will take you to the book at Amazon, place your cursor on the book icon there, and conduct a search for "Hodges," and you'll find your way to my story's beginning, on page 105, where you'll be able to access the first three pages, the third page being an illustration by Terrance Lindall. That's all I have time to blog on this morning . . . I've borrowed this image from the Kay Wyne Fine Art Blog, which features the art of Kay Wyne, so click on over to see what you like. 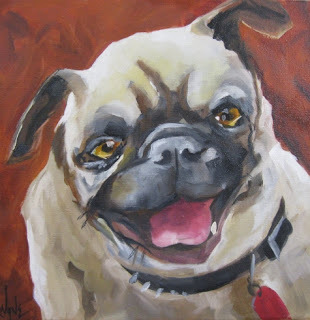 I needed an image of a pug for today's blog entry, and this particular one looked crafty enough for my purposes. You might conjecture that, having attained a mode of life which gave me comfort and security, I would have declared myself satisfied. There is no doubt that this should have been the case, but I was always a little excessive in my own ambitions. They might have even been said to have been above my station, but when your height is as little as mine, you'll find little that isn't above you. For example, when young Fanny Price came to Mansfield -- I was not much older than her then. At my point of vantage it was not difficult to see how she trembled, from fear and shyness, not from pettishness; from long study attained by my often motionless state, I could see how environment and not nature had made her physically deficient from her cousins, who had grown up with the advantage of clear air and sunshine unmitigated by city smoke. All this was a matter of note to me but merely from a clinical vantage point, as I was then a voracious reader and sought to make my tedious idle time more usefully employed by reading. That ought to be sufficient to testify to the quality of this story (though one appreciates it even more if one's read Jane Austen's novel Mansfield Park) and thus also to the quality of this year's Emanations anthology. I won't give away the dire secret of the character relating the story, but every reader should know to beware the unreliability of first-person narrators. Trailing Korea . . . 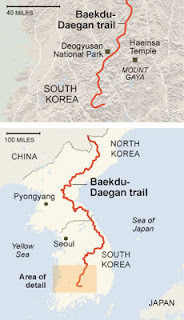 In height, South Korea's mountains are more akin to the Appalachians than the Rockies -- the highest mainland peak is 6,283-foot Jirisan. They can, however, be jagged in the extreme. We planned to cover just seven miles on the first day, but the steep and constant ups and downs soon had us aching. We often had to climb using our hands, and in many places we used the chains and ropes that the forest service had helpfully attached to the rocks. As we limped into our second morning, we decided to rethink our itinerary. Instead of sticking religiously to the trail for six days, we would weave our way on and off, stopping at villages and temples along the way. Things immediately improved. For one thing, the sun had come out. For another, we were going downhill. Soon we were following a stream, broken up by waterfalls and pools through a deciduous forest of maple, hazel and birch. We stopped to talk to a pair of Korean hikers on their way up. I would hear Gregory explain our presence so many times over the course of this trip that I began to pick up the words for sister and brother-in-law. "People look at you differently when you’re traveling with family," he said to me after another encounter with fellow hikers. "You're not a suspicious bachelor." Two nights later we found our way to another park shelter, this one just below 5,282-foot Hyangjeok-bong. At sunset we climbed to the peak and had the 360-degree view to ourselves. To both east and west, mountain ranges in shades of gray, blue and black, each one silhouetted against the next, stretched away like waves on an ocean. This is one of the things I love about Korea, the accessible mountains. Though they're generally twice as elevated as the Ozarks, they help make me feel at home. Clannish families also remind me a bit of my home, though we hillbillies aren't hierarchical, unlike Koreans, but I get along with Sun-Ae's kin, who all accept me for what I am . . . So much for the avant-garde, trained to fight what they know not what . . . but for those interested in reading more, go to Amazon and order the entire book!